Footnote: The word mortgage comes from the French words mort (death), and gage (pledge). So called because this large debt is a pledge that remains with you until death. The French have desperately short lifespans. This is so important I’m going to repeat it. And then repeat it again. Get an inspection. Houses have many potential problems that you will not notice, and that a qualified home inspector will. Before you make that pledge unto death, you want to know if the foundation is intact, or if there is other structural damage. You want to know if, instead of wood beneath the drywall, your house is being held up by termites. Or wasps. Or snakes. You want to know if the house you’re buying used to be a meth lab. Get an inspection. Ask to be present during the inspection, because you will learn a lot about your house, including its overall condition, construction materials, wiring, and heating. If the inspector turns up major problems, like a roof that needs to be replaced, then ask your lawyer or agent to discuss it with the seller. You will either want the seller to fix the problem before you move in, or deduct the cost of the repair from the final price. If the seller won't agree to either remedy you may decide to walk away from the deal, which you can do without penalty if you have that contingency written into the contract. The home inspection is your most important tool for understanding how much you’ll need to spend on repairs — and when. A good inspector will get really nit-picky and will make note of every little thing. That’s a good thing — that’s the inspector’s job! Ask your inspector for a copy of the inspection report, and use it as a checklist and timeline to budget your home repairs. After all, you will no longer have a landlord. For more on the mountainous expense involved in becoming a homeowner, keep reading. Oh, and the inspector should be chosen by you, the buyer, not the seller. Ask your family, agent, broker, therapist, etc. for recommendations. This may border on superstition, but a dead dog is a really bad omen, and a likely dealbreaker. Why? Really? Do I have to explain why a dead animal is a bad omen in almost any situation? Ok, let me explain. True story from my personal experience. I was a newlywed, scouring sunny Los Angeles for my first house to share with my lovely new bride. We found a great house, in what seemed to be a nice neighborhood. We drove around to the alley in back, to reach the garage. Much to our visceral entanglement, smack in the middle of the alley was a dead dog. As if a dead dog isn’t bad enough, it looked like it had been there for a couple of days. While finding a dead dog wasn’t enough for us to run away immediately (now it’s your turn: Really? ), it was a giant waving red flag. It was the main reason we eventually looked elsewhere. After all, we reasoned, if a neighbor doesn’t immediately call to have a dead animal removed (or doesn’t bother to gather his own best friend from the alley), you can bet that there are other, bigger problems in the neighborhood — and that the neighbors are either fully desensitized, or that dead pets are a low priority on the list of problems. And you probably don’t want to live with either of these possibilities. Walk around the neighborhood. Signs of life — or death — may be signs of bigger things. Ever agree to buy something from someone? You send the money and don't hear back for a while so you start stressing that the seller took off with your money? That's what escrow is for. Escrow acts as a neutral party between house seller, buyer, and lender. It's a period between the seller accepting the offer and the buyer taking ownership. The escrow agent makes sure all of the parties' requirements are met before the money is finally delivered. We’ve all heard the story of the buddy who moved into a gorgeous, spacious — and dirt cheap — apartment above a night club. Why so cheap? If you haven’t guessed, I guarantee your buddy knew — the first night he tried to sleep in his new apartment. boom ba-doom boom, boom ba-doom boom all night long. I once lived in an apartment that was right next to two bars. Every Sunday night, the bar across the street had karaoke night. It's bad enough when people are butchering Coldplay and Sir Mixalot. When they are butchering Whitney Houston and Barbra Streisand, it’s a special kind of hell. Worse, the other bar — the one right outside my window — threw all of its recycling into the bins … every night at 2:30am! Needless to say, from then on I scouted my new neighborhood at night, before moving in. Same deal with houses. In your prospective new neighborhood, look for bars, fraternities, or neighbors who throw parties. Look for traffic too. Even if there’s a party house a block or two away, the parked cars and noisy pedestrian traffic could prove annoying after a while and, while it may or may not be a dealbreaker, it’s still good to know what you’re getting into. Remember, unless you plan to flip your house, i.e. sell it quickly for profit, you will most likely want to live there for at least a few years. Neighbors keeping you up all night with disco lights and boom ba-doom boom boom ba-doom boom might be a small annoyance, but what if it’s every weekend for the next five years? Could you stand it? Dealbreaker? Even more dire is the possibility of a drug house. If a nearby house has visitors at all hours of the night, you can bet that at some point one of the visitors will have red and blue lights on top of their car. It could get ugly. Visit your prospective house at night, during the week, on a weekend. Loud music? Lots of cars parked outside? Red cups or little glass vials littering the street? Could be a dealbreaker! Check out your neighborhood’s culture and convenience. Is there a grocery store within walking distance? A coffee shop? Public transportation? Freeway? Bike trail? Gym? School? Library? Bar? If any or all of these are important, decide just how important. If you drive to work, try it one day from your potential new digs. If the distance or traffic make the commute very long or stressful, it may weigh into your decision to buy a house in that location. Now that our neighborhood has checked out, let’s take a look in our wallets. First off, know how much you can afford before you start shopping. A rule of thumb is that you can afford housing that runs about 2.5 times your annual salary. If you’re buying the house with a significant other, remember to combine your incomes. You’ll also want to make a down payment, and you should think about where that money might come from (savings, gifts, retirement, etc.). Check out this really cool guide that helps walk you through the first few steps. The mortgage market is ever-changing. Learn something about the different types of mortgages available. 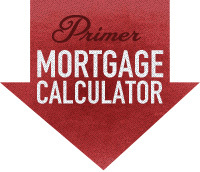 Check out a mortgage comparison tool, like this one, or this one. Footnote: If you don’t live in these areas, don’t worry. Just try a search for something like “[your county] assessor”, or “[your county] property tax”. In place of “[your county]”, enter the name of your county. County, not country. Duh. Homeowner’s insurance is another expense. Again, this varies widely depending on where you live, but usually ranges from several hundred bucks to a couple thousand bucks per year. Yeah, vague. For more info, check out the MyMove.com Resources pages. Ask the seller for a couple of recent tax and insurance bills to help give you an idea of what you’re getting yourself into. Condos and townhouses — or in some cases entire blocks & neighborhoods — have HOA (Homeowners Association) maintenance dues, or “pride of ownership” dues. These usually cover costs such as maintenance and upkeep of public or communal areas. These costs are good to know up front, and to include in the monthly budget. Remember that you’ll also have to pay the utilities. Again, ask the seller for copies of a few recent bills (electric, gas, water, garbage), to get a head start on your budget. Another thing to know about being a homeowner is that you no longer get to call the landlord. Remember my article about fixing the toilet? It will come in handy now that you have your own house, because you now have to fix (and pay repairs for) everything! Once you’ve added up all these costs, you may find yourself broke. Dealbroke. Dealbreaker. Here’s another dealbreaker: it may make more sense to rent. In your particular city or neighborhood, does it cost more on average to own or rent? As a general rule from Money Magazine, if you pay 35% less in rent than you would for owning (including all the costs we’ve just covered, such as mortgage, taxes, insurance, HOA, etc. ), it’s smarter — financially anyway — to continue renting. On the other hand, if you over-sweat the small stuff, you could be the dealbreaker. Says Carolyn McKibbin, “Many first-time home buyers lose promising deals because they nickel and dime over small things.” Don’t insist that every light bulb be replaced before you sign the deal, or someone else might sign it instead, and you’ll have to continue living with your parents. Yeah. How did I know, right? Footnote: You are getting an inspection, right? If you have no idea what I’m talking about, return to the beginning of this article. Do not pass Go. Do not collect $200. Read it again. And get an inspection! Countless first-time home buyers have gotten themselves into dead-end houses because they underestimate how much money and work are needed to repair a house. Just like buying a vintage sports car, unless you know what you’re doing, it’s probably cheaper to spend more up front on a newer house than to try your luck with a cheap fixer. Unless you have actual work experience in some area of construction (carpentry, plumbing, electrical, framing, concrete footings, etc. ), avoid any house that is not immediately livable. By livable I mean with working plumbing and electricity, intact floor, walls, roof, ceiling, windows and doors, etc. If your first thought is, “I’ll just live in my [trailer / tent / car / yurt] until it’s fixed up”, just keep living there until you save enough money to buy a livable house. 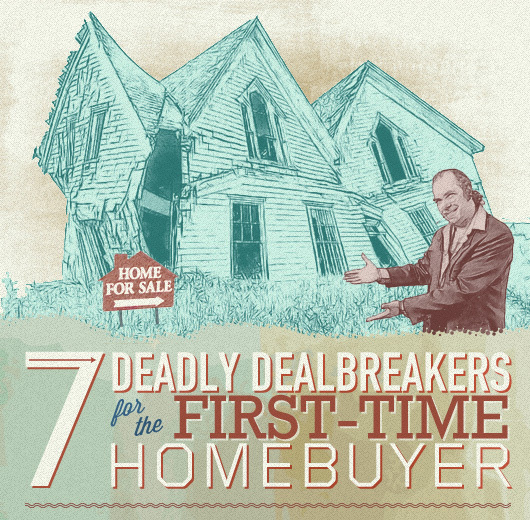 As you’ve seen, there are plenty of dealbreakers on the way to home ownership. We’ve covered a few. It’s a big decision, so know what you’re getting into. It can also be an emotional decision, so be sure you can afford to buy a house, and that it makes more sense to buy than rent. There are lots of tools at your disposal, and you most likely have family or friends who have been through it before, so ask. Buying a house can be a scary decision, and will probably be the biggest financial transaction you’ve made so far. It can also be rewarding, in many ways, so try to have fun. Remember, it’s not rocket science: if it looks like a dealbreaker it probably is, so don’t be afraid to walk (or run) away. Then run back and tell us about your dealbreaker. Annualized income shouldn’t be taken into consideration. Monthly cash flow should. The amount of cash flow you allocate to a mortgage (not taking into account taxes and insurance) should be no greater than 15% of gross (before tax) MONTHLY income. Important because people are still getting pushed toward and approved for upwards of 30%. Also, there is no mathematical difference between a 15 year and 30 year mortgage. It’s a myth. In fact, a 30 year has tremendous advantages over a 30 year given our current economic landscape. Google: How the affluent manage home equity. Great guide, but definitely use a more comprehensive mortgage calculator (better yet, talk to a mortgage/loan officer) so you can get one number – mortgage, insurance, fees, taxes, etc. Then you’ll really know what you can afford. The best way to check the house worth is to see oits roof streangth if it is able to secure contnet under it you may get reaxation from Fix motor home leaks for many years.